I must have a play with some of these equations and if I can figure it out, add them to my program ManpWIN. Thanks to everyone who contributed to this most interesting thread. Hello all. Very interesting progress so far. Twinbee... any chance of you extending your article so it has a page 3 titled "for coders" or something similar? ie, a pseudo code structure for someone wanting to try these formulas out who is more programming inclined rather than mathematically inclined. Assuming that the reader has a basic raytracer or raymarcher coded up and have the ability to have a ray starting from the "camera" and know the "direction" the ray is going, then you step a certain amount along the ray and repeatedly try the mandelbulb formula to see if the point is inside or outside the set and plot the point in 3D space accordingly. 2. So Z starts as (1,0,0) and C starts as (X,Y,Z) when iterating the formula? 3. Does the distance estimator calc happen while the iteration happens? 4. Am I on the right track? It would also be nice to have a series of "DistanceEstimatorNylander" "IterateNylander", "DistanceEstimatorMakin" "IterateMakin" snippets of code depending on who first came up with the idea. Looking back over this thread shows many attempts that may not be the true 3d mandelbrot type, but never the less result in interesting results. It would be great to have some info along the lines of "the above picture uses the following formula by whoever" and have the relevant snippet/change in code for distance estimation and iteration. Or even a basic sample code for distance estimation and iteration of the now classic ^8 result. Enough to get the basic framework going and have a play with these sort of images. Keep going regardless guys. There is some great results in this thread so far. Just some questions and comments, which may already have been discussed, I didn't have the courage to go through the 36 pages of comments. - Is the inversion necessary? What happens if you drop it and use the formulas above instead? With both the formulas above and the original ones, the complex plane is embedded as the plane slicing the sphere through the equator, so we recover the standard M-set there. Note that (also in both cases) a neighborhood of the north pole is mapped to a thin band close to the equator, so this transformation is not continuous (unlike complex square operation in 2d). I think you can see the hallmark of this fact in some images. - Did anybody try this, and if so what are the results? Keep these impressive images coming! Spy, I think the change of sign was an fix they made to correct the wrong cartesian2polar change of coordinates they were making (same for all those +PI/2 etc you see in the beginning of the thread). I believe most of the latest images in the thread are created with the """correct""" formula (in whatever xyz, xzy system). At leas I'm using the correct version (for the "standard" academic xyz coordinate system). I'm not going to re-post it here, it's just a few pages before this one. good work JColyer. I can definitely see the effect of the orbit trap, although I guess you can still tune it a bit more indeed. I like the feeling of your rendering, it's different. i'm interested to hear from the experiences of others on implementing this on the gpu. personally i'm seeing less-than-ideal numerical results from the gpu (need a reference cpu implementation), especially in the finite difference normal estimate, and the polynomial versions are also WAY faster than the ones using trig. thing is GPU programming is so simple, and it's so convenient for raytracing and raymarching (few examples here http://www.iquilezles.org/www/material/nvscene2008/rwwtt.pdf, but I know of other 30 works that have been released since them). Basically, you write your code in GLSL which is 90% equal to C, but with already built-in vector types and geometric functions. I usually port my code (like the Z8+C M-set of this thread) back and forth to CPU and GPU in a matter of five minutes, since it's so similar (I´m trying to avoid the word "identical") to regular C monothread programming. As for the numerical precision, for most practical applications the 32 bit floating point arithmetic is enough. You can of course want to zoom deeper in a fractal, but well, you ALWAYS can want to go deeper and that doesn't necessarily make the experience more interesting. Anyway, GPU coding is easy for anybody already using any programing language as C, UltraFractal, Basic, whatever. All this is true for regular simple to medium type of applications (like rendering fractals). More complex things can get a bit more difficult, but not that much really. to be more specific about the gpu precision issues, they don't support denorms yet and i'm sure this makes a difference for finite difference normal estimation since the subtracted values should necessarily be very close. I did try this some time ago. The results are not dramatically different. See these images (low res quick renders) of the degree 8. The only difference appears to be that if the point being iterated is allowed to go across the poles, then the bulbs are aligned (see the second image below) instead of staggered.. 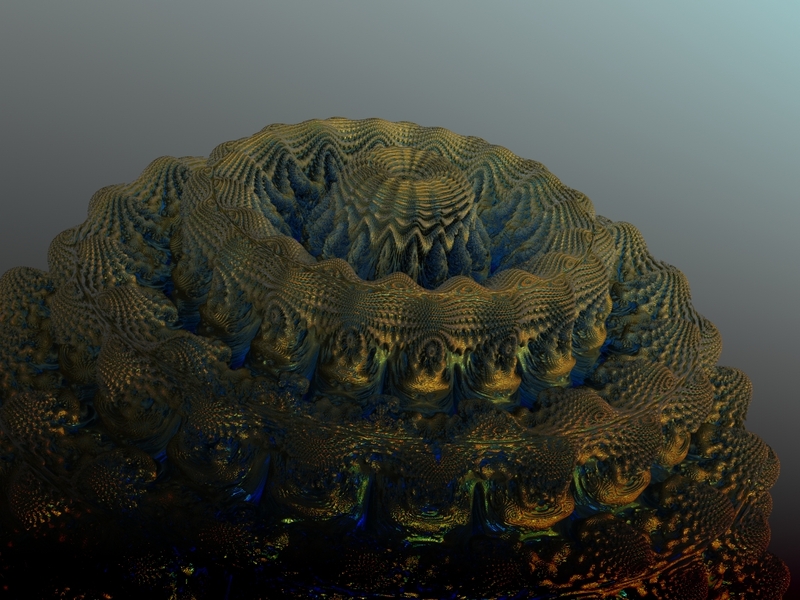 I calculated the 3d mandelbrot and exported it as a povray-script. Then added a hollow green box around it with some lights. Texture is glass. The results are not by far as stunning as some others i've seen here though. Unless I did something wrong,the results are disappointing. There is a lot less elegant detail to be found. Seems the more we go away from two dimensions, the less interesting. See below the power two and power 8 Mandelbrot sets. For those of you interested in rendering the Mandelbulbs and corresponding Juliabulbs in UltraFractal 5, I have just updated the UF database with my latest changes to 3DFractalRaytrace and the plugins for the Mandelbulb and the Juliabulb. I have gotten my gradient function working correctly for the two plugins, which really involved gettiang the correct derivative functions. The Mset lies inside an algebratic vector-space, where new calculation rules apply, which results in that nice shape.